A former defence minister has added his support to an increasing number of high-profile voices calling for the vote to be revisited. Conservative MP Guto Bebb, who quit as a defence minister in July in protest at Theresa May's concessions to Tory Brexiteers, acknowledged that many of his colleagues viewed the prospect of another vote with "abject horror" but it was the only way to resolve the issue. The Prime Minister's Chequers plan fell "far short" of the common market some Leave voters wanted and Brexit risked causing damage to the livelihoods of people across the country, he said. Mrs May has rejected calls for a so-called People's Vote and Brexiteers have argued that another referendum would be an attempt to undermine the democratic decision made by 17.4 million Britons in 2016. However, Mr Bebb told BBC Radio 4's Today that it would be "undemocratic" not to offer the public a say once it was known what the shape of the Brexit agreement secured by the Prime Minister looked like. Responding to suggestions that another vote would harm trust in politics, he said the economic hit from Brexit would be "substantial" and "the people of this country who will suffer the damage as a result will not forgive politicians who have actually glibly said that we would be alright on the night". 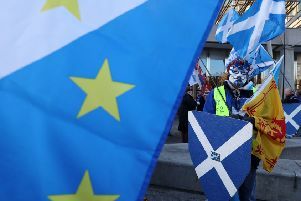 He added: "I think most of us view the prospect of another referendum on this issue with abject horror, it was one of the most uncomfortable experiences of most of our political lives, it was a very unpleasant campaign. "However there is a growing realisation across the parliamentary party that there is no majority in the House for any form of agreement that the Prime Minister manages to bring back. "As such, with heavy heart, I think there are some people now who are really looking at this issue and asking themselves the simple question: if Parliament can't decide on this issue, then how do you resolve it? "Increasingly there is a view that the people who made the decision to leave the European Union, the people of this country, have the right to express a view on any agreement - or no agreement if is no agreement - before we actually pull the plug." Monday marks 200 days until Brexit day, but major issues still remain to be resolved, including the complex problem of arrangements at the border with Ireland. Other senior Tories who support a referendum on the Brexit deal include former ministers Anna Soubry, Justine Greening and Philip Lee, and Health Select Committee chairwoman Sarah Wollaston.